Pam Margolis, at center holding a dog, is surrounded by members of C.J. 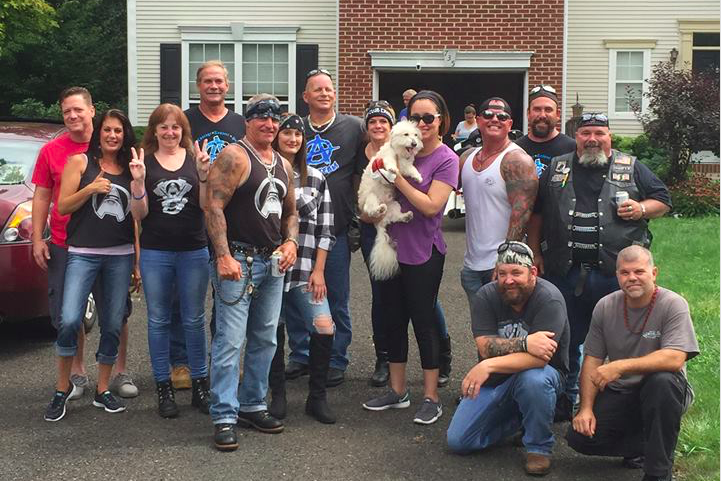 Santangelo's A Team, a motorcycle group that rolled into action after hearing that her family has been on the receiving end of a neighbor's alleged harassment for the past six years. A 38-year-old Montgomery County man was ordered Wednesday to stand trial on felony ethnic-intimidation and other charges for allegedly harassing a mixed-race family who has lived across the street for several years. If convicted, Matthew Rutkowski of Schwenksville could face up to 12 years in prison on charges stemming from complaints filed by Pam and Howard Margolis. The couple alleged that he has harassed them – and their two grown children – with racist, homophobic and anti-Semitic slurs and actions as far back as 2012. But the charges in the pending matter – ethnic intimidation, which is a felony, and stalking, harassment and disorderly conduct misdemeanors – cover alleged confrontations since 2017. “I didn’t think it would go this far,” said Pam Margolis, moments before the proceedings began. At a 25-minute preliminary hearing before District Judge Albert L. Augustine in Harleysville on Wednesday afternoon, Deputy District Attorney Samantha Cauffman added the felony charges to those already filed against Rutkowski. Rutkowski – who wore a black T-shirt, green cargo shorts and tan sandals to court – neither testified at the hearing nor looked at Pam Margolis when she took the stand as one of just two witnesses in the case. She chronicled incidents in June 2017 and in July and August of this year that were detailed in a recent PhillyVoice article. In one case, she testified, Rutkowski harassed her husband as he walked their dog Bailey, saying “n***** dog, n***** lover, n***** family” to him, which prompted them to call police. 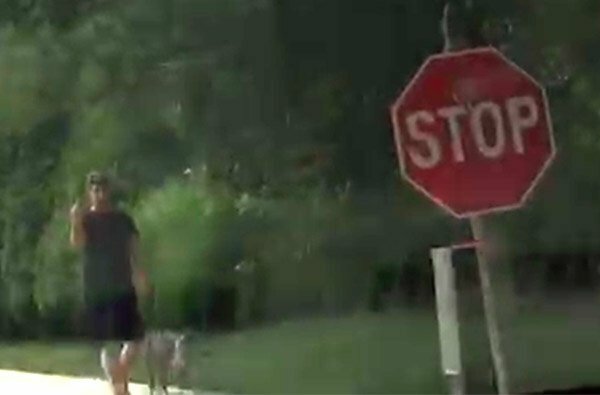 She alleged that Rutkowski again yelled that racial slur as the couple walked the dog past his house on July 4 and again when he drove past them on the street outside their homes on August 5. That latter statement was an allusion to the allegation that Rutkowski left homophobic chalk drawings on the Margolis driveway and allegedly filmed (or appeared to film) their daughter on several occasions in a “creepy” fashion. On cross-examination, Rutkowksi attorney Scott McIntosh laid the groundwork for a possible defense: the defendant did not know she was African-American due to her skin tone, and that name-calling in and of itself isn’t illegal. He also asked Pam Margolis if she knew what was causing Rutkowski to behave in the fashion she alleged. The judge sustained Cauffman’s objection to that line of questioning. Next on the stand was Pennsylvania State Police Trooper Joseph Gilbert, who responded to the Margolis call in August. Gilbert noted that Rutkowski admitted he drove past the couple but denied yelling anything at them. “He said that he did not yell that at them but that they were acting like n*****s,” testified Gilbert who, along with another trooper, told the Margolises after the hearing that they should call the Schwenksville barracks any time something happens along those lines. Schwenksville resident Pam Brown Margolis claimed her family has been subject to years of harassment from a neighbor, seen here giving her the middle finger as she drives past him on the street. McIntosh then questioned why the police reports didn’t indicate that Pam Margolis was black until seven weeks after the incident and questioned if the allegations rose to the level of the charges filed. “It’s a neighborhood dispute, just two people that don’t like each other,” he said. Augustine then ordered that Rutkowski stand trial on all charges and scheduled the next court appearance for November 28 at the county courthouse in Norristown. As part of his bail agreement, Rutkowski – who reportedly filed a harassment complaint against Pam Margolis last week – remains ordered to stay away from the couple. Should that be violated, Cauffman said she would seek to have his bail revoked.